You may have set your rear view mirrors years ago and have since forgotten all about their position. Additionally, there are several different preferences on how to set you mirrors in correct positions. Here is our suggestion on where and how to set them to help improve visibility of your car's blind spots. Step 1: Set your interior rear-view mirror as you usually would with the center of the road in the center of your mirror. Step 2: Learn your head to the left so it is touching/nearly touching the drivers side window. From this position adjust your drivers-side side mirror so you can just see the back quarter panel of your vehicle. When you return your head to its normal driving position you should see very little to none of the side of your car in the mirror. Step 3: Lean the same distance to the right (until your head is nearly in the center of the front seats) and adjust the right side mirrors in the same manner. And that's it! 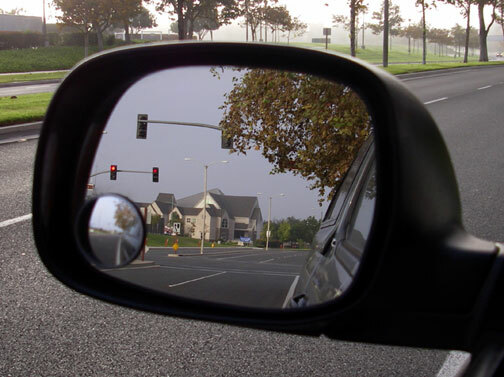 If you are not accustomed to your mirrors being in this position, it may feel odd at first. However, once you learn to rely on your rear-view mirror and what your side-view mirrors are showing, you will find that they provide you with a whole lot more useful information about the space around your vehicle. Ultimately, your car's blind spots should be eliminated and provide you with a safer ride. In addition remember to check over your shoulder and signal before you change lanes as well. As always, drive safely and obey all traffic laws.